In your quest for an effective hay fever treatment you may have seen decongestant sprays in the aisle of your drugstore. Alternately, your doctor may have suggested them as an occasional treatment. Decongestant nose sprays are effective for treating the blocked nose that occurs from hay fever but they are not usually a first line of treatment and are generally not advised for use of more than a few days. This type of hay fever treatment works rapidly and has an immediate effect, clearing your blocked nose and allowing you to experience relief. Another important use is as a pre-treatment for a steroid nose spray. 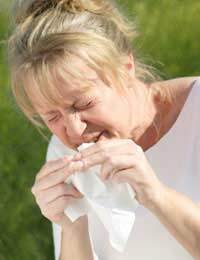 Steroid nasal sprays are commonly used to treat symptoms of hay fever. Sometimes, the blocked nose resulting from hay fever is so severe that a steroid nasal spray can't penetrate enough to be effective. A decongestant spray, however, can effectively clear your nose so that the steroid spray can successfully treat hay fever symptoms. Your doctor will likely advise you on whether this is an appropriate treatment to help obtain the most benefit from your steroid spray. A decongestant nose spray is easily used and most people will not encounter issues with use. Blow your nose first to provide an initial clearing and then place the container under your nose, squeezing lightly and inhaling deeply. Be sure to follow the instructions on the label for use, particularly to ensure that you do not overuse the medication. In fact, the convenience and ease of use is another reason that people may tend to overuse decongestant sprays and then suffer from the rebound effect. Rarely, a decongestant spray can cause shaking and heart palpitations. If this occurs, it's important that you see your doctor immediately for treatment. Children and the elderly also tend to experience amplified effects of decongestant sprays, so use needs to be particularly well monitored in these age groups. Ultimately, a decongestant spray is a 'quick fix' for treating a blocked nose due to hay fever and should not be relied on as a regular treatment, or you run the risk of a rebound effect. Keep a decongestant nasal spray on hand for those infrequent times when your nasal blockage is really uncomfortable and you perhaps have a work, school or social event that will be affected by your discomfort. By using all of the other available hay fever treatments and preventative options that have fewer side effects, you can reserve your decongestant spray only for those times when you need it most.